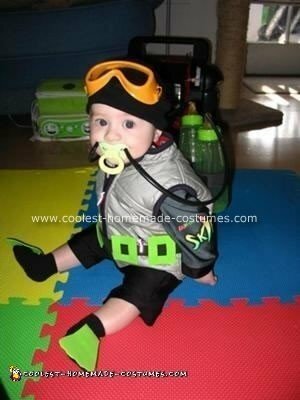 This Homemade Scuba Diving Baby Costume idea came to my hubby and I because we wanted an original costume for our son. We are both avid SCUBA divers and decided that why not start him young? We took a black long sleeve/pant onsie playsuit (black) and made the “wetsuit”. I went to Ross and found a vest for the BCD and the hardware store for the sprinkler tubing, cord and play goggles. And we took his binky for the regulator and attached it to two baby “bottle tanks” with cord. We took craft foam and created the weight belt and fins. We put on a black beanie for those cold pacific ocean dives. This would go perfect with my baby octopus costume! I love the bottles! sooo cute i’m a scuba diver as well and think this was an awesome idea! I always wanted to make a scuba outfit when I was little but lacked the mechanical knowledge of tools and materials…BUT, I was still able to tape together a couple of 2 liter bottles for tanks. You can take a 2 liter bottle and dump in some craft paint and shake it up for an instant scuba tank! You can do silver, yellow, florescent, fuchsia…whatever look your going for. Then just tape them together with some black duct tape and use an old backpack for a harness or just pop a couple holes and zip tie it to the costume. For the baby you can even use a couple 16 oz bottles. Plenty of cool cheap hoses and fittings at the hardware store to really go all out on details. I just did this to make a fake fire extinguisher for my little fireman. Nice shiny red, no mess, no smell! Paint is on the inside! You could even use spray paint and make a small funnel to collect the spray and allow it to drip inside. Shake it up a few times and your done! I’m wondering how you attached the tube to the pacifier?